A few days ago, I had some fun by writing a tongue-in-cheek column about the world’s most misleading headlines. Today, I want to share a strong contestant for the world’s most depressing headline. It’s from The Hill, and it’s the lead to a story about giddy times for Washington’s lobbying community. So why are lobbyists rolling in cash? What accounts for all the dollars flowing to the influence-peddling community? The answer, as noted in the article, is that there’s been an end to gridlock. Nearly all of Washington’s top lobby shops saw gains in revenue in the first half of 2015 as an uptick in activity within both Congress and the Obama administration translated to a boon for K Street. Following a period of relative stagnation in the two-year span preceding the 2014 elections, the Beltway’s biggest lobbying firms have broken through the malaise… “Corporations are a lot more optimistic about whether to invest in Washington,” said Marc Lampkin, a former aide to Speaker John Boehner (R-Ohio)… K Street’s top firm — Akin Gump Strauss Hauer & Feld — continued to bolster its advocacy revenue, earning $10.23 million in the second quarter. …“I think our success during the first half of 2015 reflects the…high degree of activity in Congress,” said Don Pongrace, head of the firm’s public law and policy practice. So the obvious lesson is that if you want to reduce lobbying in Washington, the best option is for Washington to do nothing. My personal preference is to make Congress a part-time legislature. That’s worked out quite well for Texas, so why not try it in the nation’s capital? But if that option isn’t available, then I’m a big fan of gridlock. Simply stated, if my choices are for politicians to do nothing or to have politicians make government bigger, the answer is obvious. Which is why I was initially very worried when I saw this headline from another story published by The Hill. This sounds like my worst nightmare. The last thing we should want is productive politicians! That’s sort of like having productive pickpockets. …the GOP presidential candidate said he’d announce tax and regulatory reform proposals over the “coming months,” as well as changes to entitlement programs and a replacement for ObamaCare. …”The overspending, the overreaching, the arrogance and the sheer incompetence in that city — these problems have been with us so long that they are sometimes accepted as facts of life…” Bush criticized Washington for operating on autopilot, ticking off a slew of pitches meant to push back against what he characterized as a needless expansion of the federal footprint. And it’s true. Fixing all these problem will require lots of legislation. If we want a pro-growth and non-corrupt tax code, we’ll have to eviscerate the IRS with a flat tax. If we want to address the long-run spending crisis, we’ll need genuine entitlement reform. If we want to limit boondoggles and pork, we’ll need some sort of Swiss-style spending cap. If we want to curtail excessive regulation and red tape, we’ll need market-liberalizing rollbacks. So while I’m generally very uneasy with the notion of a “productive” Congress, I also realize that lots of reforms will be needed to restore economic vitality. Now let’s consider one final headline. This one is from a report in the New York Times, and it also revolves around Jeb Bush and his campaign. And here’s some of what’s in the article. By and large, this sounds good. But here’s the catch. You don’t need specific anti-lobbying reforms (such as Bush’s proposed six-year ban on lobbying when Senators and Representatives leave office) if you actually are serious about reducing the size and scope of the federal government. 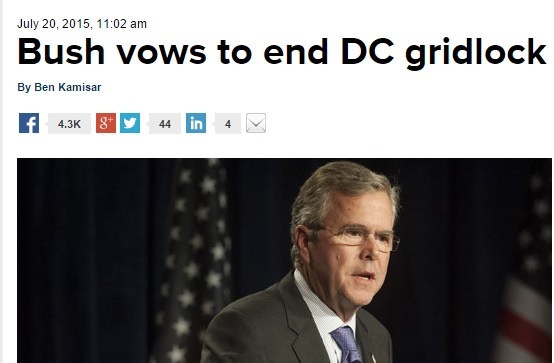 Reducing the power of Washington is the best way of starving DC’s special-interest community. Indeed, it’s the only genuinely effective way. I explain in this video that laws to control corruption in Washington don’t work because they don’t address the real problem of politicians having far too much influence over the economy. I hope you noticed the balloon analogy at the end of the video. If you don’t like Washington’s parasite class, the only way to curtail their privileged existence is with smaller government. By the way, I don’t want to imply that all lobbying is bad. It all depends on whether lobbyists are engaged in self-defense or extortion. Here’s some of what I wrote last year. …lobbying is not necessarily bad. If a handful of business owners want to join forces to fight against higher taxes or more regulation, I’m all in favor of that kind of lobbying. They’re fighting to be left alone. But a big chunk of the lobbying in Washington is not about being left alone. It’s about seeking undeserved benefits by using the coercive power of government. Moreover, I also pointed out two years ago that we need to respect what the Founding Fathers envisioned. …the First Amendment protects our rights to petition the government and to engage in political speech. So at the risk of repeating myself, I urge people to fix the real problem of big government and not get overly distracted by the symptom of favor-swapping and corruption in Washington. Jeb will probably get the GOP position (father and brother influence peddling) but he couldn’t win if the Demoncrats [sic] ran nobody. His father and his brother were bad Presidents on both sides of the aisle and people feel twice burned. It’d have to be a very very very cold day in Michigan before I’d even come close to voting for him …. OH, no, Hillarious!!!! 1. Don’t vote for a jackass or a trunkated mouse. 2. Never elect a politician to any office. 3. Write in the best person you know for each and every office on the ballot.